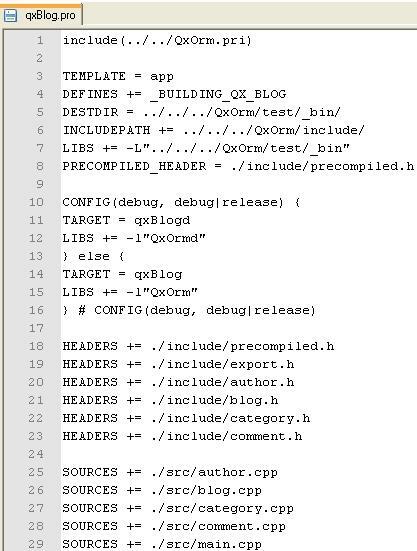 In this chapter, we will see several features of QxOrm library with the creation of a C++ project : qxBlog - blog management in C++. Note : there is a similar project in './test/qxBlogCompositeKey/' directory to show how to define an id with multi-columns in database (composite key). For more details about 'multi-columns primary key' : read the manual here. Note : tutorial source code is available in ./test/qxBlog/ folder of your QxOrm package. qxBlog.sqlite file is the tutorial database in the format SQLite. This file is necessary to compile and build the project with the command qmake provided by Qt library. The file qxBlog.pro contains the list of all files in the project (header + source) and all dependencies (QxOrm.pri file contains all dependencies with boost and Qt libraries). qxBlog.pro contains an important constant (_BUILDING_QX_BLOG) to know if the project is compiling (cf. export.h and DLL mechanism under Windows to import or export functions, classes...). QxOrm uses the same mechanism to provide some functionalities : so the file export.h is necessary to all projects using QxOrm library. precompiled header file reduces compilation times of a C++ project. QxOrm uses meta-programming concept to provide a lot of functionalities. meta-programming is costly in compilation times, so your project will be compiled much more quickly with the file precompiled.h. Last but not least, another advantage is that the file QxOrm.h includes the basic functionalities of libraries boost and Qt. It is thus not necessary anymore to write #include <QtCore/QString.h> to use the class QString of Qt for example. In the same way, there is no need anymore to write #include <boost/shared_ptr.hpp> to use smart pointers of boost library. 1 author can write many blog : we will see how to use relationship one-to-many. In the C++ source code, the properties of author class belong to columns of author table in the database. So 1 instance of author class in the C++ source code belong to 1 row of author table in the database. This mechanism provides C++ source code easy to develop and to maintain. We add 1 method to our author class : int age() to retrieve the age with the data returned by the database. We define also 2 typedef : a smart-pointer to an object author, and a list of author. author class need an id of QString type (by default, QxOrm provides id of long type) : we use the macro QX_REGISTER_PRIMARY_KEY(author, QString) to specialize the template. 1 comment belongs to 1 blog and 1 blog can contain many comment : we will see how to use relationship many-to-one. Like author class, we define 2 typedef : a smart-pointer to a comment object and a list of comment. 1 category contains many blog and 1 blog can be put inside many category : we will see how to use relationship many-to-many. This kind of relationship need a new table in the database to save the list of id for each relationship. Like author class and comment class, we define 2 typedef : a smart-pointer to a category object and a list of category. 1 blog is written by 1 author, can have many comment and can be put inside many category. So this class has 3 relationships : one-to-many, many-to-one and many-to-many. Like other classes, we define 2 typedef : a smart-pointer to a blog object and a list of blog. QxOrm can communicate with many databases (see the list of databases in Qt web site) => persistence. Important note : QxOrm doesn't want to hide sql query (by default, all sql queries are displayed). QxOrm cannot resolve all problems with sql and databases, so it is sometimes necessary to use QtSql engine of Qt library to write your own sql query or stored procedure. QxOrm can also be used with relationship one-to-one. We add to our project the class person (person.h and person.cpp files) : 1 person is 1 author. So person and author share the same id in the database : this is a relationship one-to-one. Note : we add to person table the column mother_id. So we can retrieve the mother (of type person) belongs to 1 person : this is a relationship many-to-one on the same table person. Moreover, if 1 person is a mother, we can retrieve the list of childs (of type person) : this is a relationship one-to-many on the same table person.